Advertisement - Click to support our sponsors. layout is perfect, says Gregoire. DELORESE Gregoire is standing at the mountain top, and she can see the promised land. To the nonvisionary, her Eden looks like four ramshackle buildings at the top of Kamehame Ridge in Hawaii Kai. To Gregoire it is the perfect home for Winners Camp, the teen enrichment program she began 15 years ago. The nonprofit program, which offers one-week social, academic and personal enrichment training for young people, has won national recognition and boasts 8,000 graduates, many of whom return as teachers. But its ability to grow has been hampered by the headache of finding a site for each camp. "It was horrendous," said Gregoire. "My energy is taken up each camp in getting a site. "We'd have everything set up to use a place and then their group would decide they have to use it." She and her army of volunteers once created a tent city in the meadow at Waimea Falls Park because another site canceled at the 11th hour. program. It is used as a signal to tell parents they need to talk. the program has meant to them, here. So last year she gave up everything, all income-producing work, all outside stresses, to concentrate on finding a home for Winners Camp. And then she stood up in front of her fellow Rotarians at the Rotary Club, Honolulu chapter, and made a declaration. "In the year 2000, I declared I would break ground for Winners Camp. Dec. 16th we broke ground," said Gregoire. It was her 54th birthday. As a result of the Rotary Club meeting, Gregoire was introduced to Paul Cathcart, senior asset manager for Kamehameha Schools, whose area of influence includes the 3.5-acre site of a former Army barracks at the top of Kamehame ridge. For years it was used to support a Nike missile installation. "It's been pretty much vacant since the Army left in the mid '60s," said Cathcart. Winners Camp made a pitch for the property, which was endorsed by faculty members familiar with its work. "When the package was presented to the trustees they thought it was a terrific idea," said Cathcart. 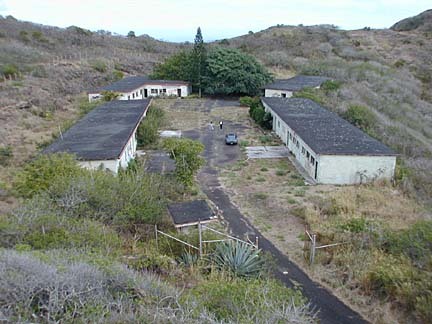 In lieu of rent, Winners Camp has agreed to include Kamehameha students and teachers in its programs in exchange for a 40-year license to use the property. "There's an educational benefit to the school," said Cathcart. "Having a physical presence up there will also improve the security of the site," he said. Though the area is closed to unauthorized vehicle traffic, there is ample evidence of vandalism on the property. "We feel there will be some stability given to that ridge site. It is a unique ecosystem and a group like Winners Camp, they're just the perfect stewards for a site like that," he said. Delight radiated from her 5-foot, 4-inch frame as she stretched her arms within the crumbling compound. She asked, without pausing a nanosecond to doubt the answer, "So can you just see it?!" The first two buildings will house classrooms and dorms, she said as she stepped through an empty hole that used to be a doorway and onto cracked remnants of a linoleum floor. The dorm with the ocean view will house a classroom for introspective exercises. "Look at this view!," she exclaimed, pointing through holes that used to be windows. "That's why this room isn't the academic room, this is the touchy-feely room." Two buildings at the compound's rear will house offices, live-in staff and support services. One already bears the rusted remains of a large kitchen. The excitement Gregoire musters for the project ahead is not born of any naivete. She's seen the ugly side of life, and knows the power of a positive vision. "I lived in 13 foster homes and was abused badly," said Gregoire. Born in Salem, Mass., she grew up all over New England. "What is Salem famous for? Witches. I'm a good witch," said Gregoire, who is not one to dwell on the negative. "We have a saying in camp, 'Be bitter or be better,' and I chose better." When she was 8 years old, she saw an Arthur Godfrey show filmed in Hawaii on television. "I said, 'I'm going to move there.' "
And as soon as she was 18, she did. Her first job was serving cocktails at Tahitian Lanai. While she was free of the foster care system, she hadn't yet found her path. Then 15 years ago, she signed up for a "Money and You" course. "I wanted to make more money. That was my goal. I had this idea that if I made a lot of money I would be good enough. I was always told I wasn't good enough. Even my parents didn't want me. "We learned to turn off our negative internal dialogue and turn on positive affirmations. And that's what we learn at camp." Before the course concluded, she realized money was not that interesting once she was OK with herself. She also knew where her true path led. "I said, 'Wow, I wish I'd learned this when I was a teen-ager.' That was the epiphany. I wanted to live my life with integrity and I wanted to teach teen-agers that by being their word they could reach their full potential." Winners Camp was born. But, like Gregoire, it spent it's childhood without a home. "For it to live in perpetuity, it's got to be more than just me to live on. It's got to have a home," she said. Gregoire has won support from the neighborhood board and is in the process of securing permits from the state Department of Land and Natural Resources. She's writing letters to the likes of Steve Case and Bette Midler, wealthy folks who have a Hawaii connection, asking for support. And with the support of Rotarians, churches, parents, alumni and others in the community, she's looking to get a lot accomplished through elbow grease. "We have a lot of volunteers coming up and helping clean up the site," she said. "The military has already helped us clean it up tremendously. "Right now it doesn't look like much," she said. "We're going to need money. We're going to need support to get this up and running by this summer." She shrugged off skepticism of such ambitious plans with another tenet of Winners Camp: "If it's to be it's up to me," said Gregoire, beaming.